Consistent Weekly Pay you can count on. A Driver Focused Benefits Package, with low out of pocket rates/deductibles, that still offer excellent coverage. Free "Rolling Dr" Program, Vacation time, Holiday Pay, Safe Driver Rewards and 401K with a match. 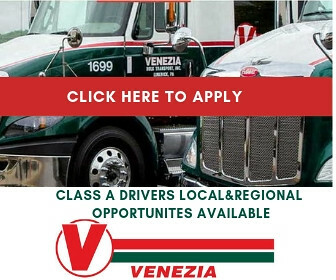 We'd love to talk with you about Venezia, what it's like to work here, and what working with us can offer you as a driver! Give our Recruiting Dept a call today -CLICK the APPLY BUTTON or Text VTRUCK to 41411 for info and application.